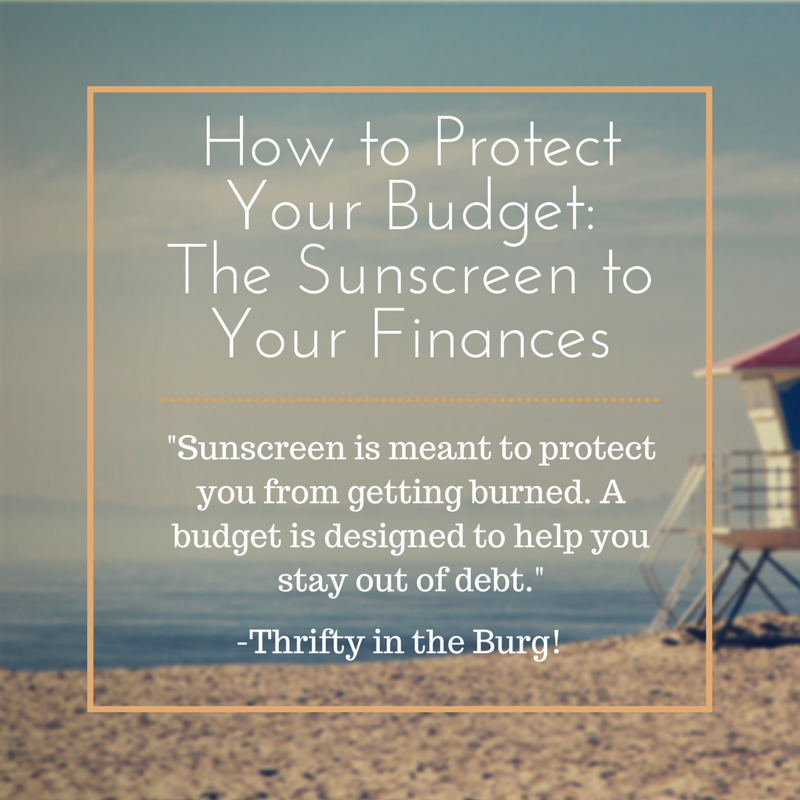 Thrifty in the Burg: How to Protect Your Budget: The Sunscreen to Your Finances! 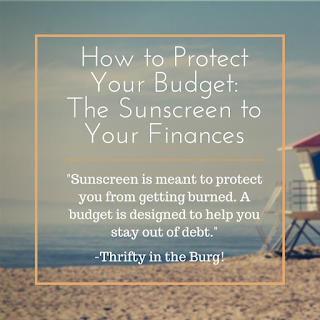 How to Protect Your Budget: The Sunscreen to Your Finances! Since summer is coming up soon, I thought it would be fun to use summer metaphors for a budget. Sunscreen! When I think of sunscreen I think of the oily lotion I put on my skin and the unmistakable smell of "summer." What is the purpose of sunscreen? Well, it protects you from the sun of course. It comes with a 5 step process of applying, checking the SPF, reapplying through the day, making sure it's waterproof, and dealing with those hard to reach areas. If you don't use your sunscreen, what happens? You get burned. The same can be said about how we set and manage a budget. When I think about a budget I think about the endless times I have tried to figure out my budget and how I can make it work. Sometimes it might feel like a budget is tedious and a waste of time, but trust me, it is not. Like all things it is important to develop a system that works for you. Just like using sunscreen (gotta love metaphors! ), it takes steps and so does using a budget. Here are a few necessary steps to take, to manage and protect your budget. Applying your sunscreen is like creating your budget. You realize the need for sunscreen and you apply. Similarly you realize the need for a budget and you apply it. You start by assessing what might hurt you. Ask, "What areas am I spending too much in?" Sunscreen is meant to protect from getting burned. A budget is designed to help you stay out of debt. Coming to that realization is the starting point, because then you realize there is a need for self-control and limits. Spf applies to the amount of financial protection you need to give yourself. You understand your financial means. You have the flexibility to play and get a fun tan or lay under your umbrella and enjoy the protection you have. Set up a budget that works for you. Sometimes, in the midst of having fun, we forget to reapply our sunscreen. In relation to our budget, we realize we are spending too much and not saving enough. We get burned. You will know if your budget is too restrictive and unrealistic as well. Make a reasonable budget through trial and reapplication. Waterproof sunscreen is more likely to stick. So before you dive in, make sure your budget is waterproof. A budget tailored to your lifestyle and financial obligations, is more likely to become a habit and last. The way to make it waterproof is to work at it until it becomes natural. Isn't it frustrating when you come home and feel splotches of burned skin? It happens to everyone. A budget is never perfect, but that is why it is important to understand that mistakes happen. Hard to reach areas come in all kinds of forms. We can't plan for everything, so take it easy on yourself! The important lesson learned is to continue on despite the hard to reach areas. Do you use sunscreen?! What are some tips you would add to help protect your budget? Cute comparison!!! Thanks so much for linking up with Share The Wealth Sunday!